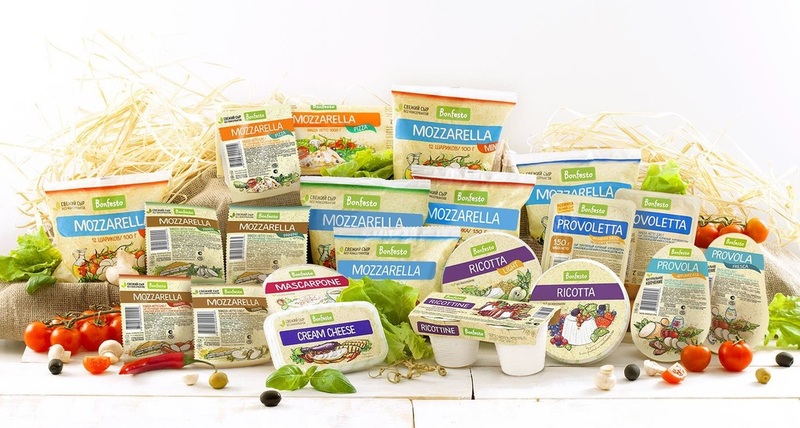 ​An extensive range of cheese products under the brand Bonfesto including Mozarella, Ricotta and Mascarpone. Mozzarella is one of the most widely known Italian cheeses. It is a classic mozzarella in brine, used in pizza salads and appetizers. Semi-hard cheese Mozzarella Pizza is a cheese of the Pasta Filata group. It is best served hot. It is famous for dishes requiring roasting and heat treatment, for example, as a filler for pizza, panini and pasta dishes, such as lasagna. Ricotta is one of the variety of whey cheeses. Ricotta light is a delicate cheese containing less calories, i.e. its fat content in a dried substance is equal to 40 %. Its healthy properties are a result of the high content of vitamins, microelements and easily digestible protein. Mascarpone is a conventional Italian soft cheese produced by the cream ultrafiltration method. It possesses a creamy consistency and delicate sweet flavour. These particular qualities make it to be perfect for desserts.